Space station-themed restaurant in Kowloon City serving Western fare and Instagrammable desserts. 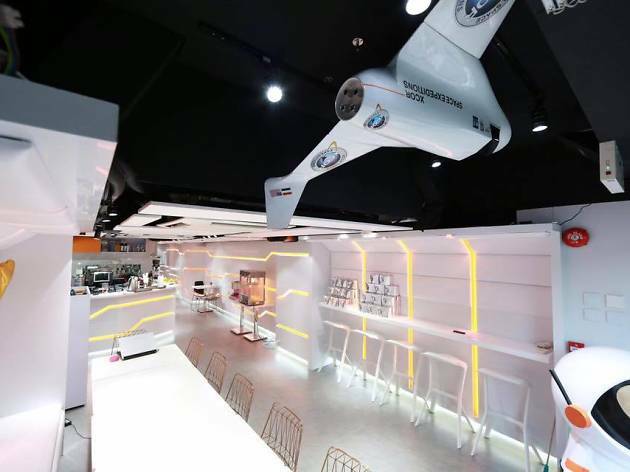 Clearly spotting a gap in the market, Enos Space Station is proud to be Hong Kong’s first space station-themed restaurant – something we’ve all be dying for. What does one expect from such a themed eatery? Why rocket-shaped waffles served on a popsicle stick, of course. The menu is filled with aptly-named dishes like Space Pasta and Space Rice. You see where this is going. Despite the lack of creativity with dish names, Enos shine with their range of Japanese soft-serve ice cream and the egg pudding with cream puff is a must-try – and photogenic too. Don’t forget to take a selfie with the monkey in a space suit out front.